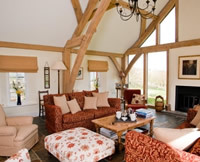 We like the sound of this special offer in the beautiful South of Devon in August… £300 OFF a luxury farmhouse that can sleep up to 12. Although much of the availability for this self catering property has now gone, there are still a couple of weeks left so it’s not too late to grab a bargain. Broad Downs Farmhouse offers a spacious contemporary living space perfect for larger parties looking for a quiet rural retreat this Summer. Relax in the sunshine with the children in the outdoor pool, play ball games in the beautiful shared gardens. Broad Downs is just a short five-minute drive from the picturesque sailing town of Salcombe with its beaches, waterfront, shops and restaurants. Beautiful walks connect with miles of coastal paths at Bolberry Down leading to Salcombe, Soar Mill Cove, Hope Cove and Thurlestone, whilst Bantham Beach, popular with surfers from far and wide is just a 10 minute drive away. The location provides an ideal secluded country retreat, the perfect base for exploring neighbouring coves and beaches and the market town of Kingsbridge (a 10 minute drive) and beyond to Dartmouth approximately half an hour away. The offer is for weeks commencing 2/3 August and 9/10th August (Thursday or Friday change-over available) with the price NOW £3525, under £42 per person, per night, based on 12 sharing, if booked before 20th July.